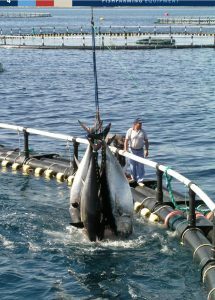 Tuna farming. The wild bluefin tuna are kept alive and carefully transferred to towing cages. The transfer action is a crucial activity as specimens may suffer severe stress that may lead to death. At present there is no efficient method to establish the fish biomass moving into the towing or farm cages making it rather difficult to determine the size and age composition of the fish. During the transfer process the fish are gently forced to move from the purse seine net to the towing cage usually by sewing the nets together. Once the tuna are all moved into the towing cages, tugboats are used to transport the fish from the fishing area to the on-growing or farm site. Towing speed does not usually exceed 1–1.5 knots in order to avoid excessive tuna mortality. However, such a low speed implies long transportation trips that may last days, weeks or even months which are further complicated by the need to adequately feed the confined fish. Mortality rates during transportation are usually quite low (1–2 percent) although there have been rare cases where all the fish have died. In the Mediterranean, the companies engaged in this form of mariculture start stocking their tuna cages in late spring (May/June). This input season lasts for a couple of months (May/June or June/July), however, in the case of Croatia and Malta the season may extend to late summer (September). Mediterranean tuna farms largely use circular ringtype open-sea floating net cages, either built locally or purchased from several large equipment manufacturers. The size of the cages varies from 30–90 m in diameter, with net depths commonly ranging from 15 to 20–30 m. The industry mainly uses cages with a 50 m diameter and net depths varying according to sea location. The larger cages (i.e. 90 m in diameter) are mainly used by the Spanish operators while those in Croatia prefer smaller ones in terms of net depth, i.e. 13 m.
Generally the weight of the stocked tuna is between 150–200 kilograms, however Croatian operations generally start their farming with smaller specimens weighing around 8–25 kilograms, while countries like Italy, Malta and Spain may even stock giant tunas weighing as much as 600 kilograms. In the Mediterranean, there are mainly two types of cages used, those for “farming” and those for “fattening”. The “farming” cages are designed to contain generally small tuna specimens for long periods of time often more than 20 months. Most countries in the region do not retain the fish for such long periods and usually only confine the tuna for periods of 1–7 months. The “fattening” season which may extend to February and generally not beyond December/January is closely linked to the market demand/ opportunity. The fish may also be sold few days following capture as harvesting is often agreed beforehand between the producer and the fish trader. Many Mediterranean countries, including Portugal, are currently farming Atlantic bluefin tuna: Croatia, Cyprus, Greece, Italy, the Libyan Arab Jamahiriya, Malta, Morocco, Spain, Tunisia and Turkey. Farms obtain fish from local fishing fleets as well as from vessels bearing other flags (e.g. Malta and Cyprus often obtain their fish supply entirely from foreign vessels). Croatia, France, Italy and Turkey have the highest number of vessels used in tuna fishing (FAO, 2005).